Material selection for the Pewaukee Lake House has been driven by several factors: energy efficiency & greenness, appearance, and authenticity. This has led us to several new suppliers and many new techniques! At the same time some of our standards have not varied: the house is well insulated, energy efficient and airtight thanks to foam sheathing, housewrap, and dense-pack cellulose insulation. I'll focus on energy efficiency systems in this article. There is 2" foam insulation under the basement floors and also 2" foam on the exterior of the concrete walls. 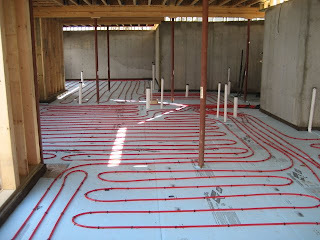 The concrete basement floors have radiant heat installed by Cardinal Heating and they are finished with an acid staining technique by Hottmann Concrete. On the inside finished walls there is another 1" layer of foam, then fiberglass batts. By encapsulating the concrete in these layers of insulation, not only do we have over an R-26 wall it also helps to use the concrete wall itself as thermal mass. The main framed walls of the house also have foam and dense-pack cellulose insulation by Rainbow Insulators to achieve R-25 in most areas. This is an even-better version of the Intelligent Wall system that we use on new homes and additions. The standard system uses 2x4 walls with R-13 fiberglass insulation and 1.5" of foam to achieve a greater overall insulation value than standard 2x6 walls without any foam can. 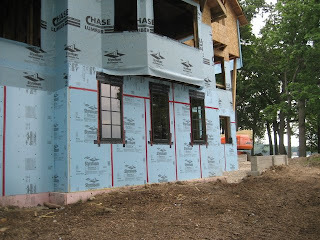 In this home we have used R-15 cellulose insulation, continuous OSB wall sheathing, 2" foam, and housewrap for a belt-and-suspenders approach to energy efficiency, moisture & air infiltration, as well as structural strength over-and-above what is required. The home has had two Wisconsin ENERGY STAR Home inspections during the construction process and will have a final test after completion. These two inspections led us to complete additional quality-control, energy-saving, and air-sealing work as we found the spots that we had previously missed. As meticulous as we are, without the ENERGY STAR system we would still miss big opportunities for energy efficiency and comfort in our homes. The fact that we fix the problems during construction gives our clients the comfort of a home build right, and when we finish, we have testing numbers to prove our quality control and construction techniques work. The complicated truss roof system has continuous venting but better yet it has been filled with as much as R-82 in cellulose insulation! Cellulose insulation is a particularly green product because of its insulating properties, its ability to help with air sealing, and its diversion of waste from landfills. 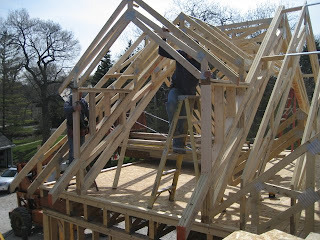 Careful detailing was required to fill the trusses and wall cavities. The ENERGY STAR blower door test, along with use of the thermal imaging camera, helped us to find a few voids in the complicated truss system. We also found a few unsealed connections of the walls and roof where the timber framed Great Room connects to the hand-framed walls and roof of the other parts of the house. We were able to locate these areas and fix them by having the insulators add insulation in truss voids and using expanding foam to seal complicated areas. The results of our work will be revealed in the next month or so when the homeowners have moved in, doors are adjusted, and final exterior details are completed. I'll address the heating and cooling of the home in an upcoming post. Energy efficiency is the goal of most home renovators today. There are a lot of emerging standards that measures the energy consumption and construction of houses. I really liked the renovations that you've done on Pewaukee lake house. the insulation materials are eco friendly and can help in cutting down energy incurred. We also renovated our house last year and installed the same materials through the help of insulation contractors (ma). 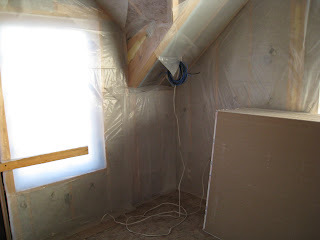 There are a lot of options, but we chose cellulose (ma) insulation since the material is made of non toxic materials. So far, it is a good choice since our energy costs had been lessened. I suggest other renovators to try the same type of insulation. Tyler, this was actually a new construction project! But we also use the cellulose in our renovations. That's great. I think cellulose insulation is still a good option for new constructions. I really like what you did on the house. I'll be reading more posts from your blog to get some tips on other construction ideas. Thanks!